A panel discussion in a basement conference room on Parliament Hill yesterday grappled with the herculean human task of responding to humanity at its most inhumane. Marking International Human Rights Day, the speakers addressed historic specifics of war crimes, genocides, and crimes against humanity that have occurred in Sri Lanka, against Armenians, against Greeks, and, of course, during the Holocaust. Sheer logistical limits on the possible number of panelists gave rise to the question that hung above the proceedings: what about the dozens (hundreds? thousands?) of other bloodbaths that from time to time mark us as beasts? To the extent that those giving witness commemorated all such horrifying crimes they were, as the event host Conservative MP Garnett Genuis noted, speaking to nothing less than the problem of evil itself. It was the very scope of their challenge that gave such beautiful audacity to their uniform rejection of vengeance, and insistence on the practical paramountcy of acknowledgement first, then reparation not as extraction for past wrongs, but as good faith for the future. “We want our relatives back. We want our families back. And nobody can give us enough money to get them back. They are dead. I’m not saying (reparations) are unimportant. They are important. But acknowledgement is the most important. That is the key,” said Elly Bollegraaf. Bollegraaf was born in Holland in 1940 and was sheltered by “righteous Gentile” Dutch families. She was among the “lucky” ones: 150 of her relatives were murdered before she was five years old. One of them, she said, was a talented photographer who wanted only to go about his world making pictures. It’s a question at the heart of an eternal conundrum, Bollegraaf suggested, that carries genocidal crime forward in waves that engulf future generations. The heinous acts cease. Immediate pain eventually eases. But, without acknowledgement, the unknowing can suffocate, asphyxiating even our relationship with God. 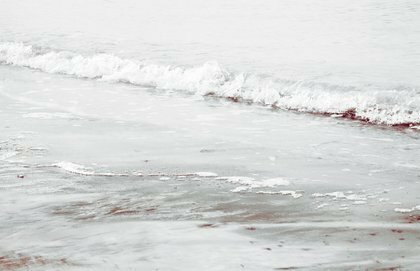 "It’s a misunderstanding of forgiveness if we think it means forgetting or condoning." We’re all familiar with the formulation: how can a just and merciful God abandon all to horrific death or, what is in many ways far worse, save some but not others? Bollegraaf met the enigma head on by saying it asks us to look in the wrong place, that is to blame God for what the work of human hands has done. It is they, she said, who must account for themselves and give that accounting first to those they did direct harm, then to the rest of humanity. For Father Bernard Alphonsus, a Sri Lankan native now associate pastor at St. Marguerite d’Youville Church in Brampton, Ont., its crucial to avoid misunderstanding the role of forgiveness in that process. “It’s a misunderstanding of forgiveness if we think it means forgetting or condoning. It does not. Any crime must be acknowledged before it can be forgiven, and crimes against humanity, must be acknowledged in front of humanity,” Fr. Alphonsus said. 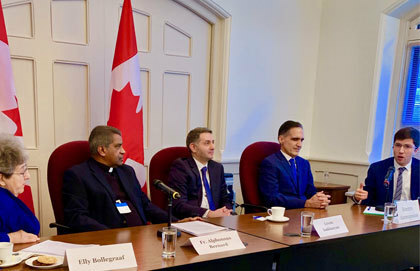 Levon Isakhanyan, of the Armenian Diocese of Canada, noted that after more than a century, descendants of those massacred in 1915 are still waiting for formal admission by the perpetrators that the genocide was a genocide. It is possible as Christians for Armenians to forgive individual perpetrators. The Greek Ambassador to Canada, Dimitris Azemopoulos, said it’s also the way forward to reconciliation by recovering the ground of truth. And in turn we leave the world infinitely vulnerable to the human turn toward evil.